Now that I’m getting a hang of using this transcribing software, I thought I’d try out another favorite Death Cab song that’s fun to play on the piano. This is basically just the intro part, but just enough to at least get the gist of the song. This song is fairly easy and can be learned in just a few minutes. I’ve also been working on finishing Transatlanticism, which is taking a bit longer, after all it’s a 7 minute song. I’ve got the first 4 minutes or so done, with the exception of all the little nuances, and if you’re keen on the piano, once you get the basic chords down, you’ll pretty much be able to play the last 3 minutes of the song. Anyway, here’s What Sarah Said off of Plans. And as a side note, I have no idea if anyone else has these songs already written up somewhere else on this vast Internet. I learned how to play these two DCFC songs (along with a few other other songs I’ve figured out over the years) without the use of any other medium, just a CD player and piano and a lot of time and patience. That having been said, these transcriptions are not note-for-note, but as close as my ear can hear it. And hopefully good enough for anyone else wanting to impress their girlfriend when they bust out their musical talent and play some sweet Death Cab. Listen to the MIDI version. 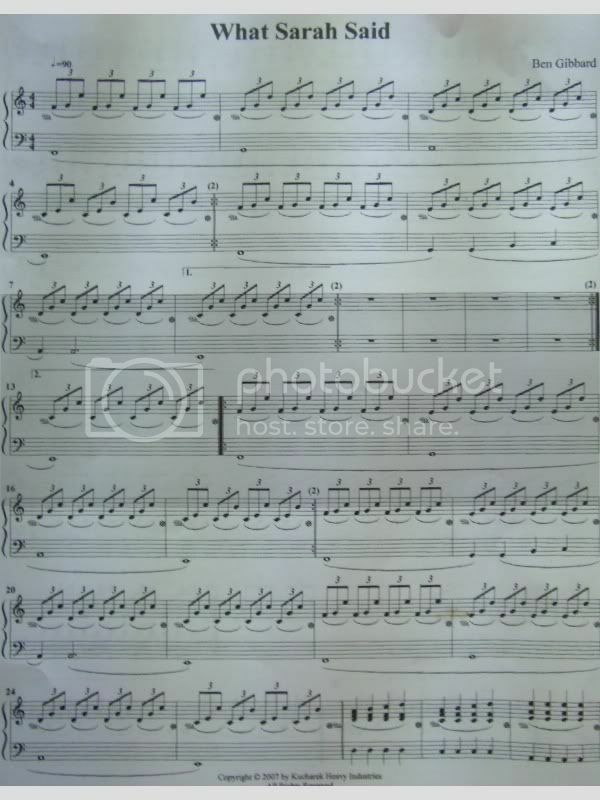 This entry was posted in Music and tagged sheet music, what sarah said. Bookmark the permalink. Thanks for the recommendation, unfortunately the cheap software I’m using doesn’t allow me make any corrections with respect to timing or grouping the notes. I’m looking for something better that will allow more advanced editing options as well as the ability to add the lyrics. My friend asked me to transcribe this same song for him, and I’ve been working on it for the past week or so. If you still care, I’ll let you know about some things I’ve discovered in transcribing it. First thing, almost all of the right hand is in triplets, not eighth notes. When you couple it with 4/4 time, it works perfectly. Also, there are some parts in the actual song where they layered the piano playing, meaning that it’s actually impossible to play it like it is on the album. Those really high notes you have on your 13th, 14th, 19th, and 20th bars are part of this layered bit. Finally, on the third time through the progression in the song, the right hand changes, the top note in each triplet being C instead of E, D, and C/B. There are other minor changes in the left hand as well. I use NoteWorthy Composer, by the way. I really wish I could send you what I have so far and get your take on it! Devin, send along what you’ve got if you can. I’d love to check it out. I’ll have to check out Noteworthy Composer. I’ve actually tried some other transcription software, that was infinitely more complex that what I was using, and eventually just gave up. You’re right about the higher notes, they’re actually played an octave lower (I think), and it does sounds like it does some other stuff, which puts them right on top of your other hand. So I just play it up higher. At the very end up the song too it changes to just playing the top C as well. It’s cool to meet other people who like to figure out songs, what else can you play? I found out how to fix the timing so I redid it, based on your comment and the other guys’. I was listening to the song again and was thinking about the middle parts and maybe I’ll try and figure those out too, do you have the chords part already? I could also e-mail you the .nwc file, but you’d need to download and install a reader to see it. This is the song in its entirety, and I included appropriate rests and such where there was no piano. Doesn’t make it ideal for someone to sit down and perform it by themselves, but then again, I don’t suppose the song was intended to be played solo in the first place. As for other songs I’ve done; this is it. I just did it as a favor for a friend. I’ve been looking everywhere for this. Appearently DCFC never released a songbook for this guy either. I just got done with my last transcription project and was hoping to tackle this one. I wanted to start from existing sources, but might have to go nearly from scratch because few ppl have put this online. The problem with Devin’s is that it’s almost certainly not 4/4 time. 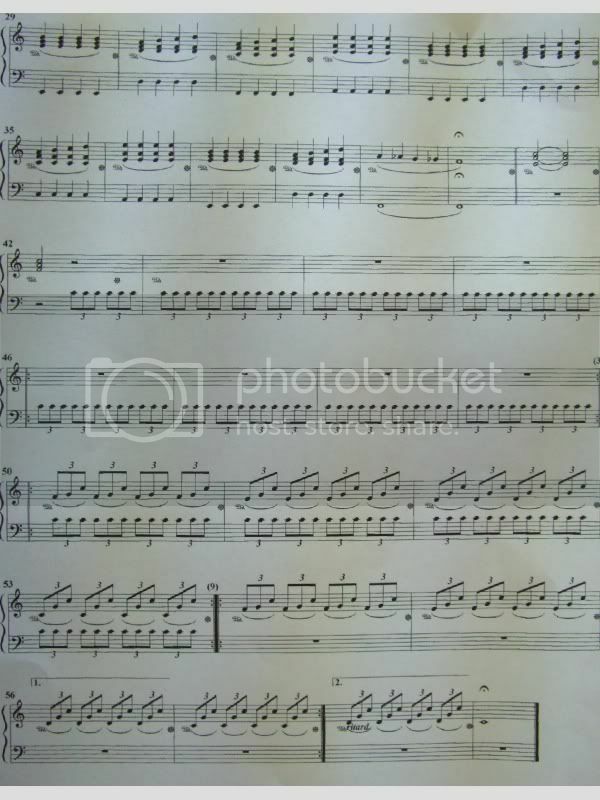 The problem with Dan’s is that it’s missing the middle section, and that the top of it needs to have a bbm marker… I’d say from Devin’s that in 12/8 time it would be 270 beats per minute (eighth notes). The resolution of his jpgs are not very good, I can’t see the marks next to the barlines, which I’m guessing are repeat info. Okay, avoid the whole photobuckness and use a program called CutePDF. It takes the data that is supposed to go to a printer and spits out a PDF file (wicked cool). What software do you guys use anyhow? I don’t like the way the triplets are denoted in Devin’s. I tend to stick with Guitar Pro (esp. for guitar tab stuff), and Finale 2008. Hal Leonard Co never released a songbook for this guy. The only one they have out is for “Soul Meets Body”, which personally I don’t find nearly as nifty of a piano piece. Even if they had released it, much of what they publish is not entirely correct I’ve found. Any of you going to work on this song further? I think I can go from the mp3 and Devin’s jpgs and Dan’s intro to something more finished. hey! do you have the whole version? i love this song! Hey man! Thanks for the What Sarah Said music. I’m plannin on jammin this song with my brother and I needed that piano part. You saved me from buying all of the sheet music. Can’t wait to practice!